1 On the right side of the band room, Wendy Wood sucked on a reed. It was a key part of her clarinet. The other woodwind players had reeds in their mouths, too. The reeds were thin, flexible strips of wood. Damp reeds make better music than dry reeds. 2 The flutists - whose flutes do not require reeds - were the only members of the woodwind section not wetting anything. Instead, they held their flutes up and to the side. They blew across the hole while pressing different keys. It was part of their warm-up exercises. The other woodwind players slipped their reeds into place. Reeds fit into the mouthpieces of the clarinets, oboes, saxophones, and bassoons. Wendy blew through her mouthpiece. She pressed the keys on her long black clarinet and played different notes. 3 On the left side of the room, Barry Brazos warmed up in the brass section. The brass section was made up of trombones, trumpets, French horns, baritones, and one tuba. Their mouthpieces were cup-shaped. Players placed their lips inside the cups to blow. They had to make their lips buzz to play their horns. 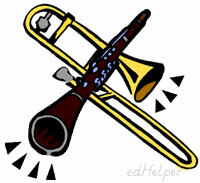 Most brass instruments have valves for changing notes, but the trombone is different. Barry changed notes on his trombone by moving his slide in and out. It was fun, but sometimes he hit the person sitting in front of him. He had to be careful with the slide. 4 In the back of the band room stood the percussion section's drums, cymbals, and other rhythm instruments. Those players kept to themselves. 5 Wendy was the first chair clarinet. That meant that she was the best clarinet player. She had won the right to sit in the first chair and lead the clarinets. Barry was the first chair for the trombone section. Wendy secretly thought that woodwinds were the best. Barry thought the brass instruments were best.